One part food, one part toy, and a whole box of fun! I yet again found myself brought back to the seemingly ancient times of my childhood by food products that made me rediscover what it meant to be a kid again. 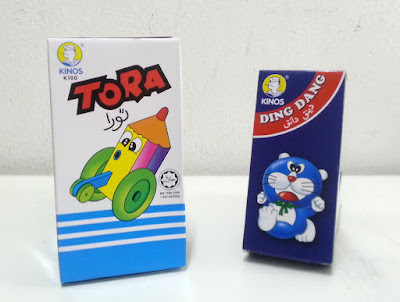 What better way to do this than by getting myself a couple of boxes of Tora and Ding Dang, EACH (because one is just not enough, believe me). Although, of all places, I didn't expect to find them at a 7-Eleven store! By the way, this is Part 2 of "A Kid's Fun, An Adult's Fond Memory". Check out Part 1 for my insights on "Nyam Nyam Rice Crispy Treat". Wait, wait, what are you talking about again?